The commercial landscape maintenance service from Evergreen Total Landscape is an all-inclusive package that customers in the Tampa Bay area have relied on for more than 25 years. Our service includes grass mowing, plant replacements, brush trimming, annual change outs, and re-designs and re-landscaping if necessary. We also have a fertilization company perform a soil analysis to determine what fertilizer would best optimize plant growth and beauty. Customers also won’t have to worry about unwanted insects and other critters destroying their stylish landscape when they choose our commercial maintenance service, as we have a certified pest control operator spray the grounds. We use state-of-the-art organic pesticides for minimal environmental impact, and can even use specifically designed organisms to help keep the insect population in check. So customers won’t have to worry about spraying for bugs month after month. For more information on our landscape maintenance service, or other available lawn services, please call or e-mail Evergreen today. 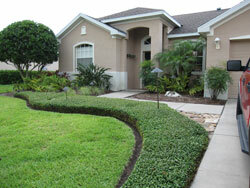 We proudly offer service to customers in Tampa, Lakeland, St Petersburg, Clearwater, and surrounding Florida cities.